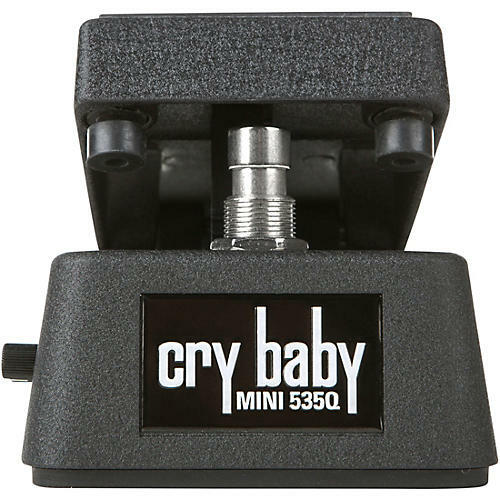 Get awesome Cry Baby tone at just half the size of a standard wah. The Dunlop Cry Baby Mini 535Q Wah provides the perfect balance of wah control and pedalboard-efficiency. Set the tonal character of your sound with the Range Selector, which allows you to choose one of the standard 535Q Wah’s four most popular sweep ranges. With the Q control, you can shape the wah’s response, from a narrow bandpass that emphasizes higher end harmonics to a wide bandpass that emphasizes lower end harmonics. If you want to a bump up to the front of the mix, just crank the Volume control and then kick the Boost switch to engage the level change. There’s a handy LED next to the Boost switch that lets you know when it’s active. The Cry Baby Mini 535Q Wah comes in at half the size of the standard version, and on the inside, it sports the legendary red Fasel Inductor. If you want to save space while retaining ultimate control over your Cry Baby Wah sound, this pedal belongs on your pedalboard.